DuckTales has been an awesome show so far! It really got me into Disney again, and with Season 2 beginning next week, I'm really pumped up! 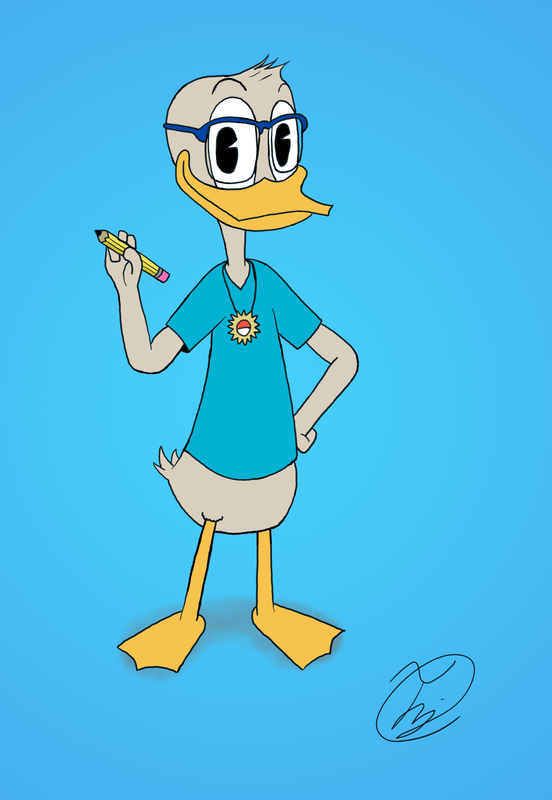 I got so excited that I just had to create a new persona (or ducksona) for this show! Anyways, here he is! Description: An introverted duck with nothing more than his family to talk to (and maybe a few people), he is described as a "duckling in a grown duck's body". Despite this however, he has great skills in creativity and high knowledge because of his status as an introvert. Personality: Creative, smart, stubborn, loud, honest, kind, silent, a bit immature. Cute pic! Your OC is nice and simple and the only complaint I have is that you might want to use some red or another color to help him stand out against the background. Unless it's intentional, having your character wear a blue shirt of a different human as the background makes him blend in a bit too much. I also think that you might want to make his bill a little bit more distinctive somehow, be a different shape in some way? I'm not sure. It would also be nice to get some of his backstory. For example, does he have a boyfriend, girlfriend, or whatever the non-binary equivalent is? What college did he go to and his he related to any historical figures Scrooge met in the past? What is his relationship if any to the McDuck family? Is he yet another relative or is he related to the Vanderquacks? If your OC has any text goes I think it would make sense for him to be an employee of Mark Beaks or for a more subtle or connection maybe he's the grandson of the person who made all those portraits of Scrooge in-universe? Maybe both? I know you probably haven't given thought to this yet but I wanted to give you some ideas for an interesting backstory for your OC and some of the ways you could improve your OC's profile. Also, I found some nice alternative designs for Lena along with a possible alternative explanation for her name that ironically occurred because of a fanfiction where she didn't appear. Blue is my favorite color after all, but granted there should some separation so that he could be seen better. The "general bill shape" that I used for James is kinda universal in the Duck universe. I understand that there are variations, but I chose the "general bill shape" since it's familiar to many. As for the others, they are noted. Thanks for your observations and constructive criticism!